06 Feb 2019 by Rahul Deshmukh. Web performance encompasses a lot of things: page load time, responsiveness for web and mobile applications. But overall, the key element is response times. How quickly can the origin server or the cache fulfill a user request? How quickly can a DNS response reach the client device? The Cloudflare mission is to help build a better Internet to everyone, and we offer multiple services for boosting the speed and performance of our customers and users. 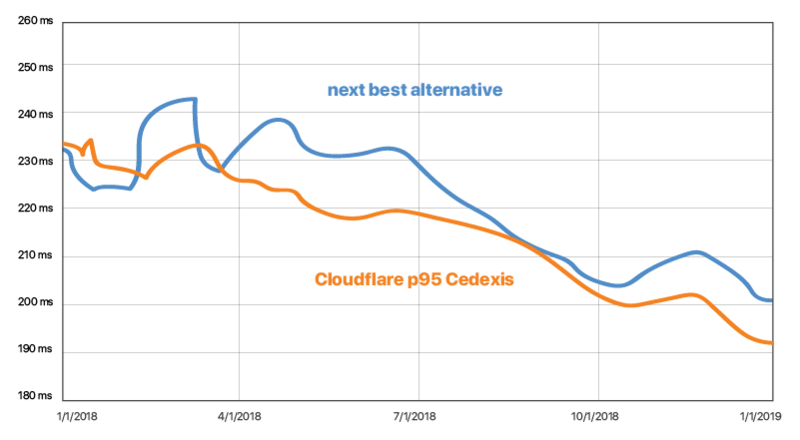 Cloudflare is faster than the competition when it comes to accelerating performance. There is a lot of research out there that confirms what many businesses and web developers already know: speed affects revenue. Better web performance means better user engagement and more conversions. Better performance also results in better SEO, driving up overall traffic numbers and increasing lead generation, sales, or ad revenue. One study by Google and Bing concluded that on average, a two-second delay in a website's page rendering led to a 4.3% loss in revenue per visitor. Another independent study has shown that 1 additional second of load time reduces conversions by 7%. How does using Cloudflare affect performance? We've seen this in action; customers have reported large performance gains as a result of implementing Cloudflare. Zendesk, for example, improved their response times by 10x, and OKCupid was able to cut their page load times by up to 50% by implementing Cloudflare. Cloudflare has a wide range of customers, from small businesses to large enterprises, but across all of them there's a similar story: Users engage more, convert more, and bounce less when content renders quickly. For instance, improving page load speed resulted in 62% more conversions for U.S. Xpress. Bidu grew leads by 30% year over year by reducing average full page load times from 13 seconds to 2.3 seconds. Argo: Cloudflare Argo uses smart routing to find the fastest, least congested path across the Cloudflare network. CDN: The Cloudflare globally distributed CDN caches web content across 165+ global data centers to supercharge web performance. DNS: Cloudflare DNS services shave crucial milliseconds off requests for a DNS lookup. Load Balancing: Cloudflare balances traffic across multiple servers or regions and uses health checks to identify offline servers. Improving page speed and performance results in higher conversion rates, better user engagement. 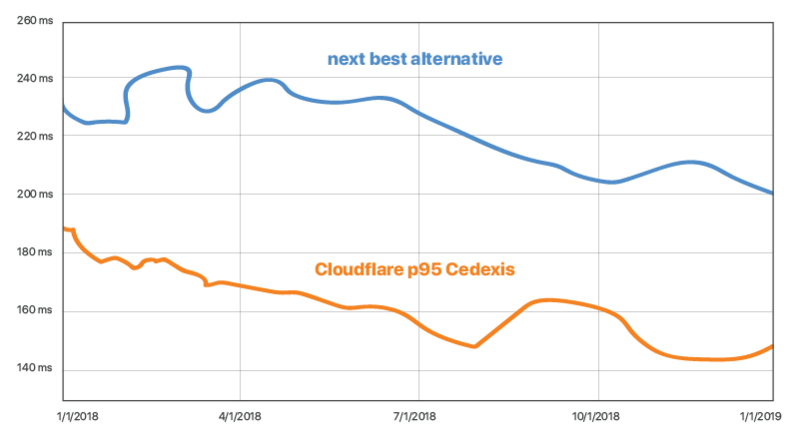 Cloudflare provides the fastest performance for web applications. Sign up here or speak to one of our experts to get started.